This travel-size Laurel Burch tote has a 2-way top zipper closure, an inside zip pocket (7 1/2" x 8"), 2 smaller open pouch pockets, double 27" handles, water resistant interior, carved wooden horse charm on the handle.and reinforced bottom panel with metal feet. Measures approximately 20" x 9" x 16". The back side has a coordinated striped design. New 2014 Laurel Burch Hobo Bag. Laurel Burch Native Horses Medium Hobo Bag - Front and back of bag depict the same image. Measures about 14.75 x 4 x 11.5. It has a top zip closure. Laurel Burch Shoulder Tote. 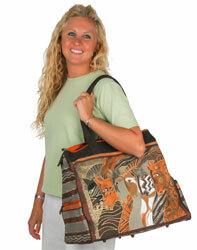 Laurel Burch Native Horses Shoulder Tote Bag - Second photo shows the back view. Measures about 23.5 x 5.5 x 15.25. It has a top zip closure.